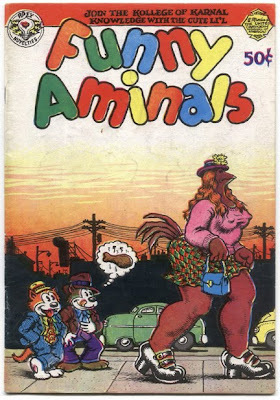 Original cover by Robert Crumb; Apex Novelties 1972. Brent Engstrom's website is here. I hate to post this here, but it's my best option. I was out of town for almost a week and when I'm out of town I can't drop peoples' submissions onto my hard drive. That's usually not a big deal, unless people send me large files and fill up my inbox. I did get some big ones and I'm afraid that one sent to me from Carlos yesterday was the last straw and I was forced to delete it to prevent other e-mails from getting rejected. I couldn't even send Carlos a response because when the box fills up, I can't even send any out. So, Carlos, please resend and shrink that file down to 72 dpi and under 1 mb. Thanks. I really should address this in the submission guidelines. And his take on this is pretty awesome. 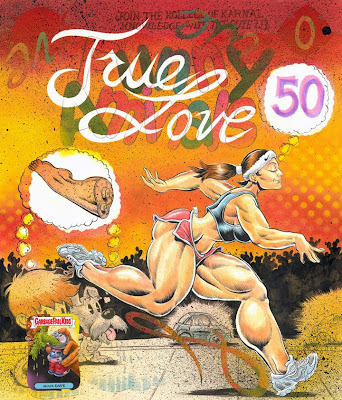 I like all of it-the second comic of 'true love' bleeding through, the cannibal child, the garbage pale sticker, the colors..all of it. Pretty nice stuff. This is really killer, one of the best. I sort of dislike the sticker only because I want to see another little fellow. I've only deleted comments that have been spam. Although yours wasn't, Colon, I couldn't see how your link was on topic so I trashed it.